I went into Superman Special #1 with high expectations - and perhaps, upon reflection, my expectations might have been too high. With people like current Superman creative team, Patrick Gleason and Peter J. Tomasi, attached along with the likes of Kaare Andrews and Bryan Hitch, I firmly believed that I would be in for a genuinely good time. I was half-correct. This book is a delight to look at, but not much else. Superman Special #1 is an extra-sized comic book, with its’ length running about 45 pages and three stories filling its’ pages. The main story is written by Patrick Gleason and Peter J. Tomasi, with pencils from Scott Godlewski. While this is easily the best story out of the three, it suffers the same fate as the other two: stories and scripts being overshadowed by the artists that bring them to life. It tells a story of Superman and Superboy attempting to rescue the soldier, Captain Storm, from Dinosaur Island. 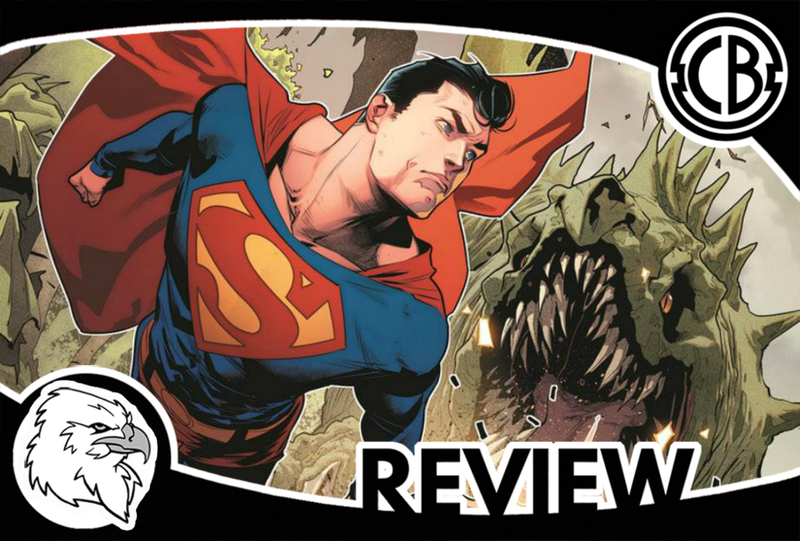 While it was fun to watch the titular character and his boy beat up on dinosaur-zombie-soldiers, this issue story does not have much going for it besides a few funny moments between the two Kryptonians, their super breath, and the interactions between the long-lost soldier. Regardless, as previously mentioned, this is easily the highlight of the book. The next story is written by Mark Russell and drawn by the legendary Bryan Hitch. It is possible that this story suffers from being restricted to a limited number of pages, but there are some aspects of the story that left me puzzled. After Metropolis is attacked by an Atlantean creature, Superman must save the tenants from a building that is about to collapse. There is a point in the story where an older gentleman that was saved by Superman is left on a medical stretcher, mourning and grieving over some of the items that he has just lost forever - pretty bad, right? It gets worse when Superman basically tells the old man, “Ehhh, you’ll be alright, don’t worry about it!” with blood splattered across his face. It left me confused and looking for the rest of the story. Again, if Russell had more pages to work with, it may have been a better read - but this the end product and it just does not work. Finally, the Ian Flynn and Kaare Andrews’ story does a little better job to wrap up this extra-sized Superman comic book. The story focuses on Superman giving the benefit of the doubt to the Atomic Skull, who is trying to redeem himself and work for the good guys. Flynn does a decent enough job with the limited number of pages, having the characters interact with each other in a believable way, but the star here is Kaare Andrews. The fight sequence and the pain that Superman feels during the scuffle is conveyed masterfully. The bright purples, blues, and yellows are also a delight to look at. While Superman Special #1 has some good things going for it, mostly the awesome artists carrying the issue, it definitely is not worth the $4.99 price tag. Perhaps if the main story was cut a little shorter, and the two featured stories got a little more time to be fleshed out, this book would have fared better. Instead, we got a relatively expensive book that would serve better as a calendar with some awesome pictures. I cannot recommend this book at this price, even with the increased page number.